This set includes : 3 ft. x 5 ft. nylon U.S. flag 18 ft. steel 5 - section black flagpole 3 in. vacuum metalized gold ball topper 18 - gauge powder - coated bronze pole 6 in. vacuum metalized aluminum cleat 1/4 in. solid braided polypropylene brown halyard rope 2 nylon snap hooks 18 in. PVC ground sleeve 2 in. aluminum truck 100% Made in the U.S.A.
We are proud to introduce a line of flag kits that are Made in the U.S.A. The All-American Series was created to deliver superior flagpoles to the public using the quality, craftsmanship and expertise of American manufacturing. Each step in the process was carefully reviewed to ensure a superior quality product. Steel poles are made with a wall thickness that guarantees durability; 18 gauge for the In-Ground Pole Kits and 28 gauge for the 2-Piece Wall Mounted Pole Sets. The ball, aluminum truck, and cleat are vacuum metalized; this process gives a superior high gloss, long lasting color retention and the durability to withstand an outdoor environment. 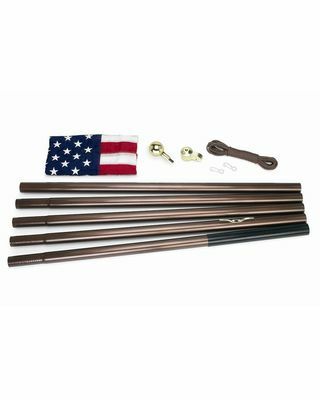 The 3-inch ball topper is made of solid hardwood; vastly superior to the traditional balls normally used in other flagpole sets. The 2 - position brackets used in the 2-piece pole sets are made from recycled high-density polyethylene (HDPE); tested 25% stronger then nylon and ABS brackets commonly used in the market.